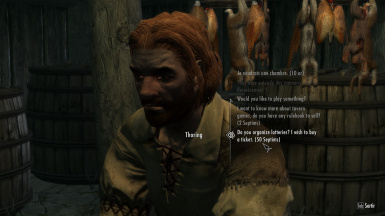 This mod adds mini games to Skyrim! Board game, card game, dice games, lotteries, etc. 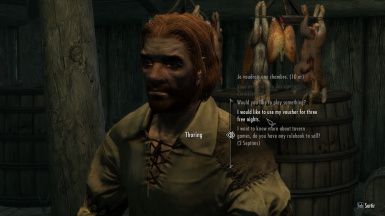 You can translate this mod. Please upload the ESP file only, and on Nexus. Stroti Resource Pack II (in version 1.5) - http://www.nexusmods.com/skyrim/mods/64590/? 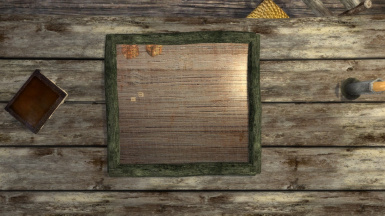 Painting Resource for Mods - http://www.nexusmods.com/skyrim/mods/18549/? _________________ Thank you to the donators! Both you and your opponent must have at least ten (10) gold coins. You are in a tavern. Works with any tavern from other mods (Falskaar, etc.). Also works in the Ragged Flagon. Your opponent is not a child. I chose to disable it because gambling with a child doesn't make much sense. Your opponent is not a beggar. The available games are the following. Please note, as SKSE is not available for Skyrim Special Edition (yet), some things have changed, but the core remains. Lotteries are organized in all taverns. When you buy a ticket, you have a chance to win something: spell tome, potions, some gold. 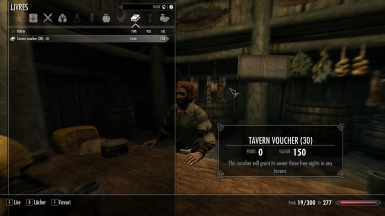 You can also win a special item: a tavern voucher, which grants you three free nights in any tavern if you decide to use it. To use a voucher, just select the corresponding topic when talking to an innkeeper. 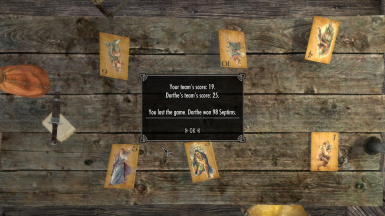 The Battle of Heroes, also called The Rule of Three by some people, is a new card game in Skyrim, probably invented by some bored people in a tavern. The rules are pretty simple. 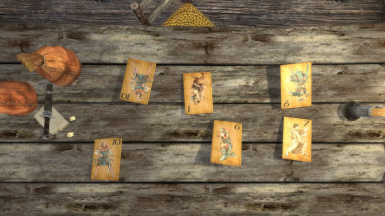 The game requires not only some luck, but also a sense of strategy from the players. We can divide the game in steps. First, each player places their bet. The maximum bet is determined by how much gold each player possesses. 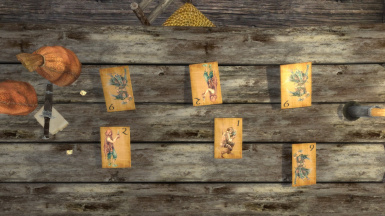 (80 X 45) / 100, which would be 36 Septims. The two players then show their hands. The one with the best hand wins the game. 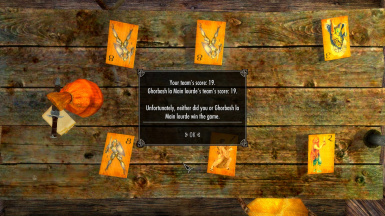 If no one wins, then for Talos' sake, everyone gets their gold back. 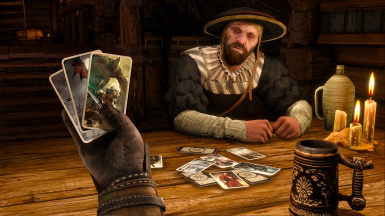 Dice Jack is another popular game played in taverns. The rules are as simple as they can be. One of the players throws two dice. The score is then multiplied by three. The number you obtain is the maximum score to not exceed. The players then toss a coin. If it falls on head, one of them throws the dice, otherwise the other one throws them. 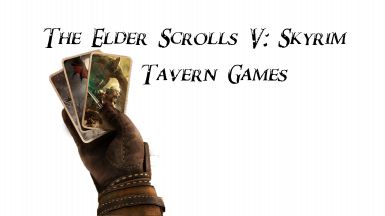 When a player throws the dice, he can do it as much as he wishes, as long as he does not exceed the maximum score. He can also decide to let the other player throw his dice, if he didn't already. The maximum score is 21. The first player throws the dice three times and gets a final score of 18. The second player throws the dice and gets a perfect score of 21. A perfect score will grant him the double of the initial prize pool. If he exceeded the maximum score, he would have lost the double of the prize pool to the first player. Sometimes it's better to just let the other player win. If you lose the game without exceeding the maximum score, you will simply have to pay the initial pool. The Prophet's Dice is a game about hazard and probabilities. The first player throws two dice. He must then guess if his opponent's score will be lower, higher or equal to his. If he thinks his opponent's score will be lower, the bet is tripled. 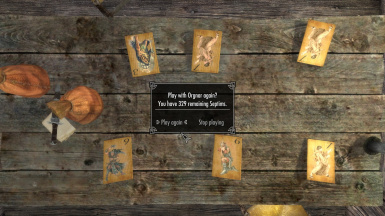 This is a very simple game, and yet very popular and addictive for many people who have Septims to lose. The Skyrim Special Edition version does not require SKSE. Thank you to the donators! Donating is an optional, and yet very rewarding thing. Props to you guys who decided to support my mods!